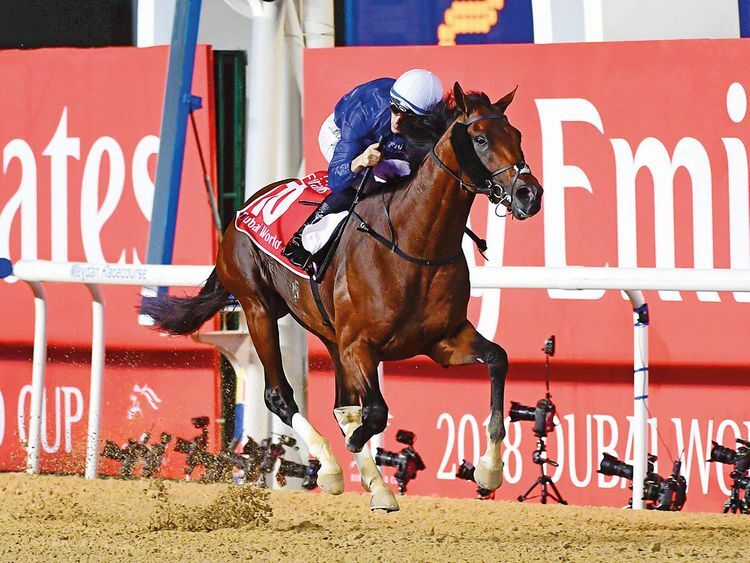 Dubai: Twelve rivals, headed by a formidable local superstar, will bid to thwart Thunder Snow’s bid for a place in the history books when the 24th running of the Group 1 Dubai World Cup, sponsored by Emirates airline, unfolds at Dubai’s iconic Meydan Racecourse on Saturday. No horse has ever won the $12 million showpiece, which is run over a testing 2,000-metre dirt track, twice although there is no denying that several gallopers have given it a good shot. A five-year-old son of Australian stallion Helmet, Thunder Snow had provided his trainer Saeed Bin Surour with an unprecedented eighth success in the race 12 months ago, when he dominated the opposition to win by five and three quarter lengths. The Godolphin star is also seeking a third successive Dubai World Cup night victory having won the $2.5 million UAE Derby (G2) two years ago. The mount of big-race Belgian jockey Christophe Soumillon, Thunder Snow makes his second appearance at Meydan this season, having finished runner-up to UAE-schooled Capezzano in his prep race, which was Round 3 of the Group 1 Al Maktoum Challenge on Super Saturday, March 9. Among his rivals on Saturday are North America, an ex-Godolphin galloper who is contesting the Dubai World Cup for the second successive year, Breeders’ Cup Classic (G1)-second Gunnevera, plus American Group 1 winners Seeking The Soul and Yoshida. He’s a horse with a lot of ability. He has improved a lot for his first run this year. Bin Surour, who has sampled successes on most of the biggest racing stages around the world, believes that Thunder Snow will deliver a huge effort under the dazzling Meydan floodlights. The Emirati said: “We always wanted to bring him back for a second shot at the Dubai World Cup after his American campaign. Bin Surour also did not read too much into the fact that Thunder Snow drew an outside gate and said: “We can’t do anything about the gate now. But I believe that in some ways it better than being drawn closer to the rail where he could land into a lot of trouble. “Christophe is the ultimate professional and he knows Thunder Snow better than anybody. He’s ridden him in 16 races and knows just what makes him tick. “I’ll leave it up to him. For sure it’s going to be a very tactical race both him and his jockey have the class and ability to handle any situation,” he added. Satish Seemar has been dreaming of winning the Dubai World Cup for a long time and admitted that his nerves are getting the better of him. “It’s very exciting to have a horse like North America in the race,” he said, “We believe that he is a big contender. He’s in the best condition we could ever have him in and he’s at good place right now. Although the race would appear to be the culmination in a rivalry that Thunder Snow and North America have been engaged in, there are several other serious contenders vying for glory including the massively progressive Capezzano, who outstayed the former in the Al Maktoum Challenge (Round 3), American hold-up galloper Gunnevera and deep closers Seeking The Soul and Gronkowski.